New York City operates at its own fantastic speed. It’s a global melting pot of people from every corner of the globe. It’s also a nexus of art, finance, fashion, entertainment, media and of course, food. It’s pretty safe to take a wild guess and state that no other city in the world has a higher density of restaurants, diners, pizza shacks and casual eateries than NYC. If you’re a foodie, then this is heaven for you. However, when you narrow things down to the expensive tier of fine luxury dining, the partitions become more defined. There are a handful of elite restaurants in NYC that even high income individuals with the deepest pockets have problems getting into. The demand for these rarified restaurants is so high that sometimes scoring a reservation means having your name on a waiting list for several months. It may all sound a little unreal, but as we mentioned earlier, everything in NYC is larger than life. Here are six of the most exclusive dining establishments in NYC. Rao’s is a slice of old school New York City. It’s a highly respected Italian restaurant located in Spanish Harlem that’s been around since 1896. Their cuisine is best described as authentic Italian, and it’s a strongly held belief that their red sauces might be the best you’d find anywhere in the world. Their large and fluffy meatballs and delicious ziti are also perennial favorites. So why is it so hard to get a table here? Well, as the restaurant started growing in popularity, the owners realized that their longtime regulars were finding it difficult to secure reservations. So to remedy this, the owners instituted a system in which these valued regulars always had first dibs on tables. For an outsider to get a reservation, he/she almost has to know somebody who knows somebody else that has a connection to one of these prime property tables. 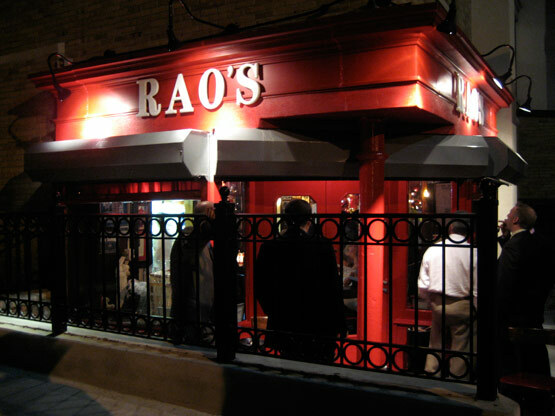 In effect, a table at Rao’s is similar to a time share situation, and this added exclusivity has only made the restaurant more popular. Reservations here may take at least a year, so be prepared to be very, very patient. Interesting tidbit: In 2009, Jay-Z proved that he’s indeed an elder statesman of NYC by filming his 2009 video for the song “Death of Auto-tune” at Rao’s. Unlike Rao’s, Carbone is an Italian restaurant that has some new tricks up its sleeve. It’s located in the hip Greenwich Village area of downtown Manhattan, and the cuisine offered can best be described as updated Italian-American. There is also a definite luxury feel about this place – the art on display is curated by Vito Schnabel and famed NYC designer Zac Posner created the suits for the wait staff. Some of the favorites here: the Veal Parm, the sizzling pancetta, an expertly executed carrot cake and an amazing wine list. Alan Richman of GQ magazine recently gave it high praise saying that “It might be one of the best Italian-American restaurants of all time.” Make sure to call about two months ahead to make sure you get a reservation at this chic and sumptuous eatery. Originally from Paris, le Bernadin is a French seafood restaurant in NYC that has a ton of accolades to its name. The name itself refers to an order of ancient French monks who loved to eat and drink. Since inception, their entire concept was based on serving fresh and simple seafood and treating the ingredients with utmost respect. Helmed by ultra-talented chef Eric Ripert, Le Bernadin has been awarded a four-star rating by the New York Times and has received more James Beard awards than any other restaurant in NYC : for Outstanding Restaurant, Outstanding Chef and even for Outstanding Wine. It was also recently redesigned in 2012, and it won another James Beard award for “Best Restaurant Design.” If you’re trying to eat a dinner here, be prepared for a long wait – Le Bernadin is certainly la crème de la crème! Ask any food critic, and they will confirm that NYC has some of the best sushi in the world. The reason most likely is the abundance of skilled master-class chefs that have relocated from all over the world to ply their craft in the global capital of the world. One of these master chefs is Chef Ichimura, a Japanese trained sushi virtuoso who operates a small seating table at the Brushstroke restaurant in downtown Manhattan. It’s worth stating here that Tribeca is one of the most affluent districts in NYC – filled with millionaire celebrities and bankers. There are several amazing restaurants in this tony section of the city, and it’s quite a feat that Chef Ichimura has created a niche here. His sushi, sashimi and nigiri are believed to be absolutely top-notch and after a glowing recommendation in 2012 by the New York Times, it’s increasingly tough to find a reservation. The seating is limited too – about 10 patrons a night, so to be safe, call at least a month or six weeks ahead. There’s been some good mojo coming from the Pacific Northwest in recently. The Seattle NFL team just won the Superbowl and rap duo Macklemore and Ryan Lewis pretty much did a full sweep at the recent Grammy Awards. That same magic powder also rubbed off on Portland native, Chef Matt Lightner who is experiencing tons of success with his buzz-worthy Tribeca restaurant, Atera. The restaurant boasts a sleek and modern décor and a very inviting downstairs lounge area. But the belle of the ball here is definitely the food itself. Chef Lightner has a created a terrific 18-course tasting menu that costs $165, and each dish has been painstakingly worked on to perfection. If you’re trying to a get a weekend reservation here, good luck – you’re in for a very lengthy wait. A week day opening might be the best way you’re getting in. Those who really know NYC are very aware that looks can often be deceiving. Sometimes the places with the most non-descript outward appearance are the spots you really need to visit. That’s the case with The Chef’s Table at Brooklyn Fare. This small restaurant is located in a non-descript area of the Boerum Hill section in Brooklyn. It’s actually a converted kitchen and it seats only 16 people, so you already know that reservations run at a high premium here. The food is overseen by Chef Cesar Ramirez and it’s a multi-course pre-fixe menu that will have your taste buds singing for joy. A meal here will cost you upwards of $200, and some of their most raved about dishes are their truffle ravioli and the brandade. The restaurant has the proud label of being Brooklyn’s only Michelin 3-star establishment and Chef Ramirez is also a James Beard award winner. Call months in advance for this one and be sure to bring a healthy appetite. You’ll need it.